A note to readers: This post doesn't contain any massive spoilers but if you haven't yet read A Cat Called Hope and you intend to you might want to do that before continuing. As noted in the post that contained a preview of it A Cat Called Hope came about in response to a number of people asking me to write a "nice" story. I finished the story yesterday and it's out in the Kindle Store today. Is it "nice"? Not really. Try as I might I just couldn't pull that off. It does however have absolutely no swearing (which should please my mother) and an ending which is hopefully uplifting rather than downbeat like so many of my other short stories. It was probably the story I've struggled most with in recent months. I was going great guns with it until Marx (the feline protagonist) left the safety of his home but then I quickly got as lost as he did. One version of the story that I played through in my head was just about him trying to get home. That just felt too 'Homeward Bound' to me though and so it went in the bin along with the plot involving a bunch of strays who he teaches to scavenge more effectively. When I sat down and thought about it I realised that what most interested me about the story was the interplay between Marx and humans. That's where Little One and the woman came in. As soon as I had them set in my head I knew the story would only work if it strayed into the darker side of life. I realised that what I was interested in writing about was Marx's impact on the lives of the humans he met. For that to be powerful those lives had to have something broken about them. As a writer writing a story from the perspective of a cat was a fun challenge. This is the first story I've written without any dialogue (hence the lack of swearing, if Marx could understand what Loud was saying I think there's be plenty). The other tricky part was building the sense that he has only a vague understanding of what human objects are (televisions, kitchens, etc) without labouring this point to the extent that it became boring and repetitive. I approached in the same way that Hollywood movies tend to treat non-English speaking characters. The first couple of lines of dialogue in their native tongue with subtitles before the seamless shift into English so that the audience doesn't have to work too hard. In my story Marx figures things out in his own terms at first and them simple, human terms slip in - girl, screen and so on. I think it worked. Let me know if you disagree. As ever, thank you for taking the time to read this post and my stories. I love to hear what people think about them so please do get in touch if you have something to say. You can hit me up on Twitter (@whatmeworry), leave a comment on the blog or (best of all) stick a review on Amazon. 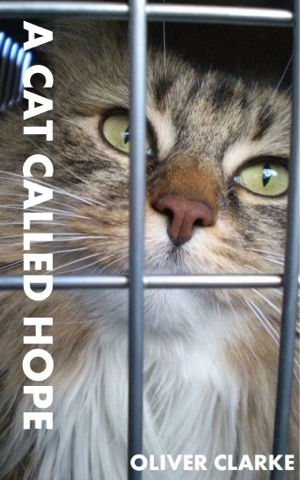 A Cat Called Hope is available now for Kindle.